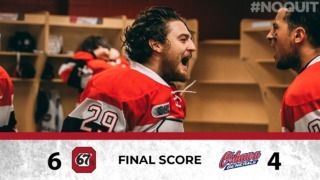 Tonight at 7 p.m., the 67’s look to even up their first round series with the Niagara IceDogs at TD Place. Sweet seats are available by clicking here, calling 613-232-6767 x1, or in person at the TD Place Box Office. Ottawa is coming off a 4-2 win, their first of the postseason, over the IceDogs on Easter Monday. The Arena at TD Place was rocking with over 4,500 rabid 67’s fans in the building cheering on the boys. The atmosphere was incendiary and no doubt helped the team to victory. 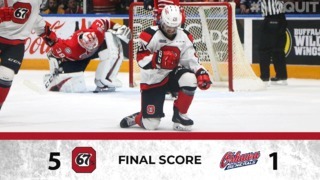 Unfortunately, Monday’s win was not without cost, as longtime 67’s defenceman Nevin Guy left the contest with a broken wrist and will miss the rest of the playoffs. This is a huge loss to not only the team, but for Guy as well, as his OHL career comes to an end in a disappointing fashion. Look for William Brown or Hudson Wilson to take his spot in the lineup tonight. Defeating Nedeljkovic was one of the brighter takeaways from Monday’s game. Before that, the IceDogs netminder had beaten the 67’s 10 straight times. Ottawa was eventually going to turn the tide, as they scored 7 goals in the first two games. In the other net, Leo Lazarev was spectacular. 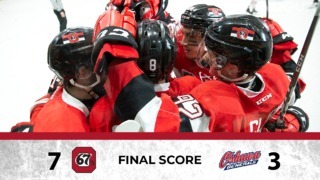 The IceDogs outshot Ottawa all game long and finished the game up almost doubling the 67’s output, 28-16. Lazarev turned away eight shots in the third, at least half of which were point blank chances late in the final frame. You can take advantage of free OC Transpo bus service for all Ottawa 67’s games! Your ticket provides you with free transit on any OC Transpo bus starting 3-hours before the game, and up to 3-hours after the game! For more information on transit service to TD Place, please visit the OC Transpo website. Pre-purchasing your parking pass is HIGHLY encouraged, as the garage may sell out. Pre-purchased game day parking passes reserve your spot and are available by clicking here. For more information on getting to TD Place, please click here. Can’t make it down to TD Place? Catch the 67’s live on Rogers TV Ottawa (Cable 22) or listen to this today’s game on 580 CFRA. Follow the Ottawa 67’s on Twitter for all the latest info and in-game updates.